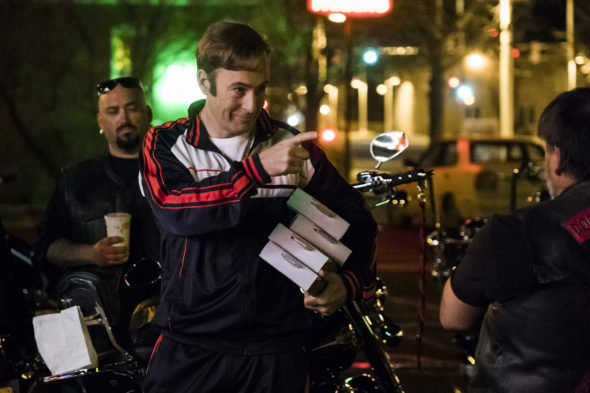 What do you think of Jimmy McGill’s transformation into Saul Goodman, during the fourth season of the Better Call Saul TV show on AMC? As we all know, the Nielsen ratings typically play a big role in determining whether a TV show like Better Call Saul is cancelled or renewed for season five. Unfortunately, most of us do not live in Nielsen households. Many viewers want a place to express their viewing habits and opinions, so we’d like to offer you the chance to rate all of the season four episodes of Better Call Saul below. A Breaking Bad prequel and dark AMC comedy-drama, Better Call Saul is set before Saul Goodman (Bob Odenkirk) became Walter White’s lawyer. The cast also includes Jonathan Banks, Rhea Seehorn, Patrick Fabian, Michael Mando, and Giancarlo Esposito. In the early 2000s, Saul is still down-on-his-luck Jimmy McGill. After the death of his brother Chuck (Michael McKean), in season four, Jimmy begins the transformation into Saul. As he edges into the criminal world, Jimmy risks his relationship with Kim (Seehorn), who ends up at odds with Howard (Fabian). What do you think? Which season four episodes of the Better Call Saul TV series do you rate as wonderful, terrible, or somewhere between? Did you expect AMC to cancel or renew Better Call Saul for a fifth season? Are you happy about the season five renewal? Don’t forget to vote, and share your thoughts, below. More about: Better Call Saul, Better Call Saul: canceled or renewed? Please do not cancel this awesome show!!! !